The average insurance rates for a Honda CR-V are $1,128 a year with full coverage. Comprehensive costs on average $268 a year, collision insurance costs $392, and liability costs around $332. A liability-only policy costs as low as $388 a year, and high-risk insurance costs around $2,404. Teens cost the most to insure at up to $4,136 a year. Includes $500 policy deductibles, liability limits of 30/60, and includes medical and UM/UIM coverage. Prices are averaged for all U.S. states and CR-V trim levels. For the average driver, Honda CR-V insurance rates range from as low as $388 for just liability insurance to a high of $2,404 for a driver that may need high-risk insurance. Where you live can make a big difference on auto insurance rates. Rural areas are shown to have a lower frequency of collision claims than cities with more traffic congestion. The diagram below illustrates how location impacts car insurance rates. The examples above demonstrate why it is important to compare prices based on a specific location and risk profile, instead of making a decision based on averaged prices. The chart below details average Honda CR-V insurance rates for different risk profiles and scenarios. Car insurance rates for a Honda CR-V also range considerably based on your risk profile, the trim level and model year, and policy deductibles and limits. Your home state has a huge impact on Honda CR-V insurance prices. A driver around age 40 might see rates as low as $810 a year in states like New Hampshire, Ohio, and Utah, or have to pay at least $1,520 on average in Florida, Michigan, and New York. Rates are averaged for all Honda CR-V models and trim levels. Rates assume a 40-year-old male driver, full coverage with $500 deductibles, and a clean driving record. 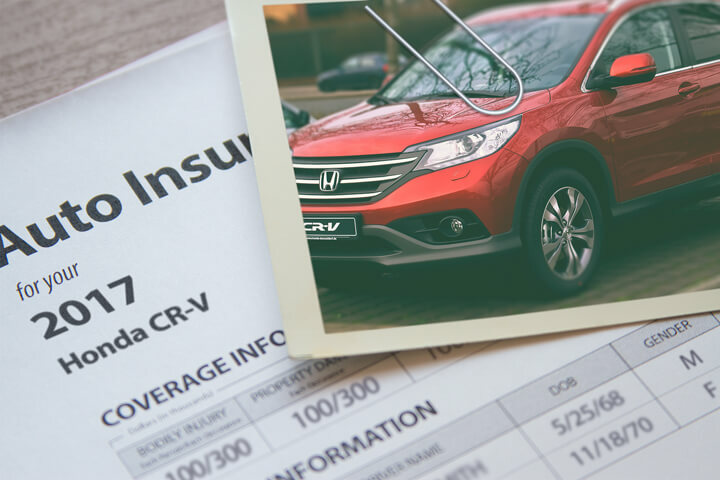 Finding cheaper rates on insurance for a Honda CR-V requires avoiding accidents and claims, having above-average credit, not filing small claims, and possibly raising deductibles. Spend time shopping around once a year by requesting rates from direct companies like GEICO, Progressive, and Esurance, and also from local insurance agents. The points below are a recap of the data that was touched on above.